Here’s another perspective on our groups Dealers Choice event from last week. Jourdo explained how we set up the pairings (teams and pilots both) in his post here. Here’s the team I brought. I thought these two would make a very good combination. I threw in UC Kate Bishop so I could use her global defensively against unblockable or Overcrushing characters. Then I added C Madame Masque to protect me from having that global used against me. Candlekeep for ramp, R Enchantress as a potential means of slowing down an opponent who was using Candlekeep for ramp. Add some cheap action dice to buy, and that’s the team. So, what did I end up playing, and how did it work? The draws for the first round wound up with me playing this Guardians team against my own Yuan-ti/Wasp team. It took longer than it probably should have – my opponent did all his Attune damage to me. There were a couple of turns where I had only a Sidekick or two in my field and he did four or six Attune damage. 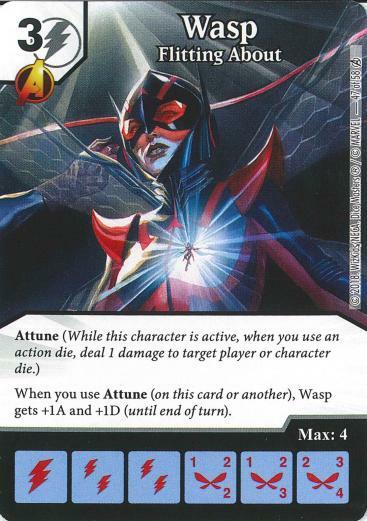 He could have picked off my Sidekick(s) with some of the Attune damage, then sent a heavily buffed Wasp through my empty field. Guardians vs. Yuan-Ti. No, the other Guardians team vs. the other Yuan-Ti team. I sent a decent sized Star-Lord through his empty field early on, then bought a bunch of cheap Guardians while he tried to burn me down with Yuan-Ti and the Tabaxi Rogue/Heist Fi. Eventually I was able to buy Adam Warlock and Yondu. Luckily for me, I drew them on the same turn, meaning I could field Warlock before Yondu. With four other Guardians in the field, that meant I did 12 damage total (as opposed to 6) when fielding Yondu, which was enough to give me the game. This round I wound up piloting our young player’s mish-mash team against the first Guardians team. Was there something there that would give me even a slight chance? Well, the team did have three X-Men in Gambit, Psylocke and Iceman and this Guardians team had Teamwork as one of its BACs. That seemed to be the best option I had. I started off buying Gambit for his quasi-ramp ability, and bought a couple of Psylockes which fairly quickly removed most of the Sidekicks from the other player’s Field Zone. I started buying Teamwork dice (managing to get all of them) and bashing at his wall with my boosted X-Men characters. I was disappointed in my hopes that he would eventually suffer a turn with some bad rolls and be unable to re-establish a strong wall. Eventually he got his Yondus out. That meant I had to stop attacking, because I didn’t want to give him the opportunity to do more burn damage by fielding one or more Yondus. We wound up in something of a stand-off for a while. He had only two Yondu dice, and they wound up stuck in his Field Zone one he field them at Level 2 or 3, because I wasn’t going to KO them if I could possibly avoid it, and if there D was higher than 1 that was fairly easy to avoid. My opponent couldn’t figure out a way to get them out of his Field Zone. His thought to use a Coordinated Strike action die for the purpose was frustrated when he realized the character ability of his Groot meant he couldn’t target his Guardians characters – Yondu included – with action dice. It’s important to note here that we mis-remembered how the Teamwork BAC actually works. It was addressed in an old, old FAQ. Teamwork actually gives your character dice +1/+1 for each active character with whom it shares an affiliation. We were mistakenly playing it as if it gave +1/+1 for each die with a common affiliation (even if they were duplicates of the same character). I somehow managed to build up my field enough that when I swung with everything I was able to get two Psylockes (each buffed to 8/8 from Teamwork) and five Sidekicks – enough to get to lethal. This was my own Yuan-Ti Pureblood/Wasp Team against a Yuan-Ti Pureblood/Tabaxi Rogue team. The opposing team also had R Dwarf Wizard and that proved to be my Downfall. We haven’t seen many blankers in our local scene for the past few months, and I wasn’t ready for it. With my Wasp blanked for the last half of the game I couldn’t keep up. The Green Devil Mask that wiped out my entire field right before he delivered the coup de grace wasn’t even really necessary, but at least it made it relatively quick. It was an interesting and fun night. Maybe more thought could be put into assigning the match-ups instead of depending entirely on chance – I played Person A in Games 1 and 4, and Person B in Games 2 and 3. 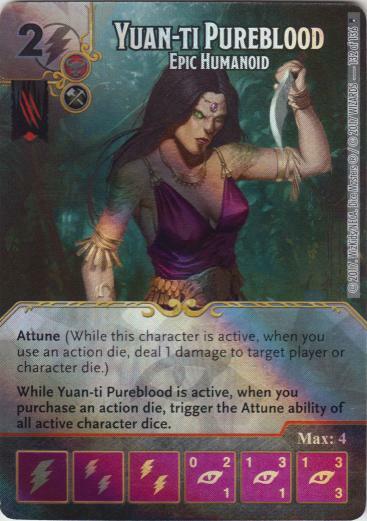 Two Yuan-Ti Pureblood SR builds and two GOTG builds out of six teams was weird, and I would have preferred to see more variety, but I don’t really see how that part could have been foreseen or prevented.